In Space Invaders, sometimes a UFO will fly past the top of the screen as a bonus target. Although Solarian II is also set in space, the bonus target is a stork. Solarian II has a weird sense of humor. The game isn’t particularly wild, but it does get about as odd as it can while still looking and acting like a space shoot-em-up. That limits how seriously you can take the game, for the better, and quietly reminds you to have fun. Arcade-style games always suggest a degree of mastery-level challenge – something thrilling. Solarian II doesn’t. It’s still at times a challenging game, but it purposely lacks intensity. 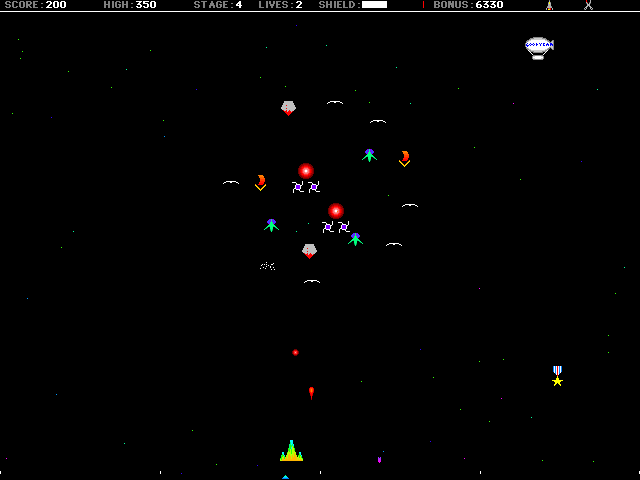 Other arcade-inspired titles like Jeff Minter’s games or the Ambrosia Software catalog overwhelm the player with psychedelic imagery; Solarian II has color but no edge. The background is blank, for instance, except for stars that on closer inspection are actually rainbow-colored. It has a laid-back vibrancy that isn’t concerned about making too much sense. That’s Solarian II‘s style. It carries through to the game’s enemies, truly a rogues gallery of squiggly lines. Your enemies are tiny shapes, basically, like The Triangle, The Kamikaze Arrow, Spots, and Oing the ball (a female ball, specifically). These things, collectively called “the Swarm,” glide around in pretty, twinkling patterns while trying to kill you. They strike quickly, especially The Kamikaze Arrow, but an army of circles and spirals can’t help but look unintimidating. The game’s help screen is in disbelief that one recurring enemy is a bird (“Why is there a bird?”). Is your spaceship a glowing mountain or something? Hilariously, as much of a real threat as the Swarm poses, the most unnerving objects in the game might be the presents that the stork (or a biplane or the Good Year blimp or whatever) drops, which slowly home in on you like brightly colored missiles. They’re much scarier than The Triangle. You can’t get tense over a game that self-deflates like this, despite it otherwise behaving like a game with a high difficulty that competitive players would sink hours and quarters into. Solarian II seems determined to take the stress out of the genre while keeping its conventions in tact. If the game becomes too frantic, it allows you to pause and go frame-by-frame. You can skip the first few levels if you want to. The game undercuts the impulse to play it like you would play its more intense relatives. Solarian II is too thoroughly strange, too easygoing. Without reinventing or deconstructing its roots, it finds the fun in them by swapping out alien monsters for Oing. 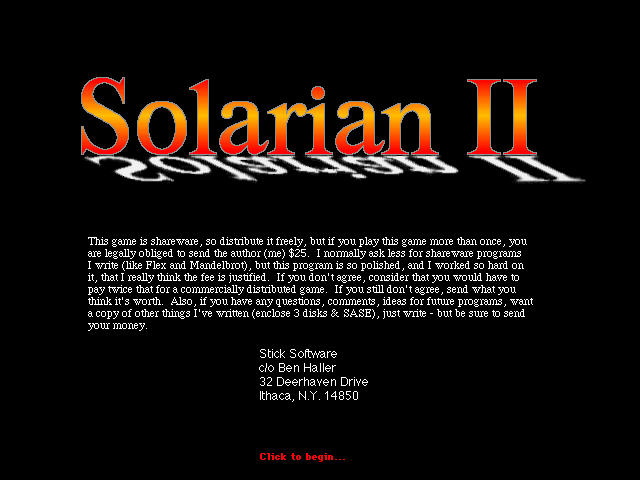 According to the official Stick Software website, where Solarian II is still sold, Solarian I was a student project never made public. Developer Ben Haller now holds a doctrate in evolutionary biology.